Note: In the Web Network Version of the program, backups are done for you automatically on the server, so you do not have to do your own backups, and the following section does not apply. By default, the program reminds you weekly to backup your database, as you are exiting the program. If you wish to be reminded with a different frequency, you can use the radio buttons in the top section of this window. They give you the option of Never, Daily, Weekly, or Monthly. If you don't set it, it defaults to Weekly. 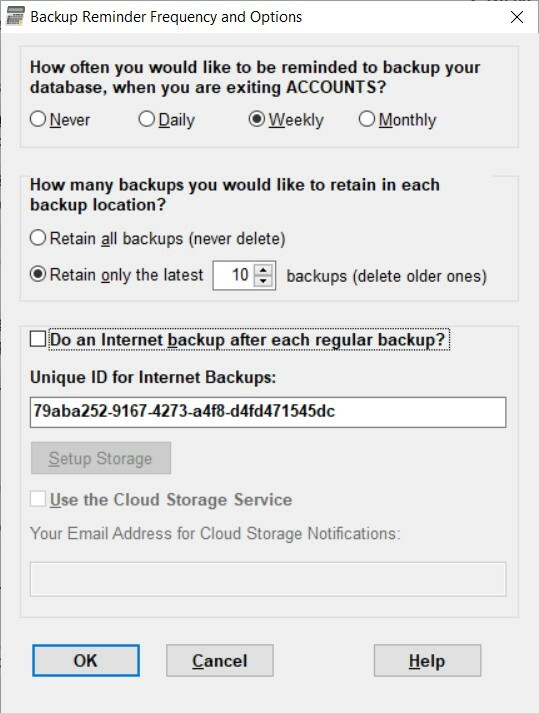 If you enable the Cloud Storage Service (described below), only the frequencies Weekly and Monthly will cause these reminders to do regular backups as you exit the program - Every Time or Daily are superseded by the fact that the Cloud Storage Service backs up every time for you. Unless you are using the Local Network Client version of ACCOUNTS, and a different user (probably the one whose computer is running the Local Network Server version of ACCOUNTS) is definitely making regular backups, it is strongly recommended that you do not select the option Never. If you are not making regular backups off of your hard drive (and someone else or some automated process is not doing so), you might as well not be using the program - there is real possibility that your hard drive and/or computer will die at some point, and you will then have no data! If you have not done a backup within the configured period of time (with either Backup/Restore ⇒ Backup Database or the Backup/Restore ⇒ Email Backup option), you will be prompted to do a backup the next time you exit the program. The middle section of this window governs how many sequential backups of each database are stored in any one backup destination, such as a folder on your hard drive, or a USB memory key. Backup files include the date in their filename, for instance OrganizationName-2012-12-31.S4ABackup (where the OrganizationName is your File Name from the Maintenance ⇒ Organization Info window) for a backup made on December 31, 2012. So normally, backups done on different days have different filenames, and they will accumulate in whichever folder or drive you are saving them in. To let those backups accumulate indefinitely, select the "Retain all backups (never delete)" radio button. To only keep a certain number of the latest backups you have made, use the "Retain only the latest" radio button, and set a number in the field following that. (You can only change that number after you have selected "Retain only the latest".) Allowable values in that field for the number of backups to retain range from 3 (fewer would be unsafe!) to 20. If you think you want more than 20 backups to be retained, just use the "Retain all backups" option instead! Trick: If you are making a backup and don't want it to be deleted by the "Retain only the latest" option, perhaps a year-end backup, change the backup filename as you are making the backup to not start with "OrganizationName". For instance, you might call it "2012YearEndOrganizationName-2012-12-31.S4ABackup (or whatever the actual date is on which you are making the backup). When the "Retain only the latest" option is turned on, only old backups whose name starts with "OrganizationName" will be deleted. The controls at the bottom of the window determine whether or not a backup to a secure Internet location is made after every regular backup. The "Do an Internet backup after each regular backup" checkbox starts out unchecked, in which case the Setup Storage button below it cannot be used. If you do wish to do Internet Backups, check that checkbox. Your Unique ID for Internet Backups is displayed on this window. It was created when your database was created, though that does not mean you have to use Internet backups! It cannot be edited. After checking the "Do an Internet backup after each regular backup" checkbox, you need to click the Setup Storage button to set up a secure storage area in the Internet storage for backups, associated with your database's internal Unique ID (which you can't normally see), and a with a password that you will be prompted for. For greater security, the password you enter must be a strong password. Note: There is no way to recover your Internet backup password if you forget it, so please be sure that multiple people in your organization know what it is. Passwords are case-sensitive. To help ensure that you cannot lose your database's internal Unique ID, two additional steps are taken by the Setup Storage button, after the basic setup has been completed. First, you are prompted with an option to email your Unique ID (but not your password!) to Cooperstock Software, for safe storage. That way if you lose everything else (but at least know your Internet backup password), we can supply the Unique ID back to you, and you can recover your latest Internet backup. A copy of that email will also be sent back to you, so you can forward it to others in your organization, for safe-keeping. After that email is (optionally) sent, a report is displayed listing your Unique ID, and with a place on which you can write in your password, if you feel secure about doing so. Please Print that report, and keep copies of it in a safe place. If you need to send that email or print that report again in the future, you can come back to this window and click the Setup Storage button again - it will not change the Unique ID. You can also copy the Unique ID to the Windows clipboard by clicking into the field displaying it, and pressing Ctrl+C. That will show a message explaining that you can then paste that into an email with Ctrl+V. You might want to do this to send it to a new user who has also installed the program, to enable them to restore the latest Internet backup. You will also have to send them your Internet Backup Password (preferably in a separate email, for security). Please note that Cooperstock Software will not store your Internet backup password for you. If we did, our computers would become a potential place of attack for hackers trying to access all ACCOUNTS program users' databases, and that is not desirable! If you have multiple databases for multiple organizations, using the File ⇒ New Database and File ⇒ Open Database menu options, each one needs its own configuration for Online Backups. When you do have copies of the same ACCOUNTS database on multiple computers, you must be sure that they are using the same internal Unique ID for Internet backups and Internet backup encryption password in both databases. The Unique ID is stored in the database, so any method of transferring the database (other than restoring an Internet backup, prior to the configuration of the second computer!) after you complete your Internet backup setup will get the same Unique ID onto the other computer. That includes transferring regular backups on a USB memory key, or using Email Backups. Alternatively, you can forward the email with your Unique ID to the user on other computer, and select an option on the Startup Options window to start by restoring an Internet backup, which will prompt for that Unique ID. You also must inform them of the Internet backup encryption password you are using (but preferably not by email - sending passwords by email is not very secure!). The final checkbox on this window, "Use the Cloud Storage Service", turns on that Cloud Storage Service, which is an automated mechanism for using Internet backups to securely share your data between multiple computers running ACCOUNTS. Please be sure to carefully read that Help page for full details. When you turn this checkbox on, you will no longer be prompted to make backups when you exit the program as specified at the top of this window if you set the frequency to Every Time or Daily, because the service normally does the backups every time you exit the program. You will still be prompted to make local backups at the specified frequency if you set that frequency to Weekly or Monthly, and in fact the program will suggest this to you if you don't do it yourself. If you have already been transferring copies of your database between multiple installations of ACCOUNTS, be sure that you have the most up to date database first on the computer on which you first turn this service on, because it will then become the "official" copy when you exit the program. Turning on the Cloud Storage Service disables the other controls about Internet Backups, because making any changes there would inappropriately affect the Cloud Storage Service. This service is not available with the Local Network or Web Network versions of ACCOUNTS, because they use a completely different way of sharing just one database file. So you will not be allowed to turn on this checkbox if you are using either of those versions.